One in four women will be sexually assaulted at least once in her lifetime. Organizations like AMEND Together and the Nashville Predators are working together to put an end to domestic violence and sexual assault. NASHVILLE, Tenn. (WTVF) — 1 in 4 women will be sexually assaulted at least once in her lifetime. Organizations like AMEND Together and the Nashville Predators are working together to put an end to domestic violence and sexual assault. Before the puck dropped at Sunday's game, a sea of teal lit up the seats at Bridgestone Arena. Those colors symbolize sexual assault prevention. 100 AMEND Together students helped cheer on the team as they battled the St. Louis Blues. AMEND together is an organization that aims to make the greater Nashville area a safer place for women and girls. They do this by educating young men about the issue and providing them mentoring. The program is part of the Nashville YWCA. "One in six women are raped," said Shan Foster, VP of external affairs for AMEND. "This is a huge issue and we are all connected to someone who is connected to this." 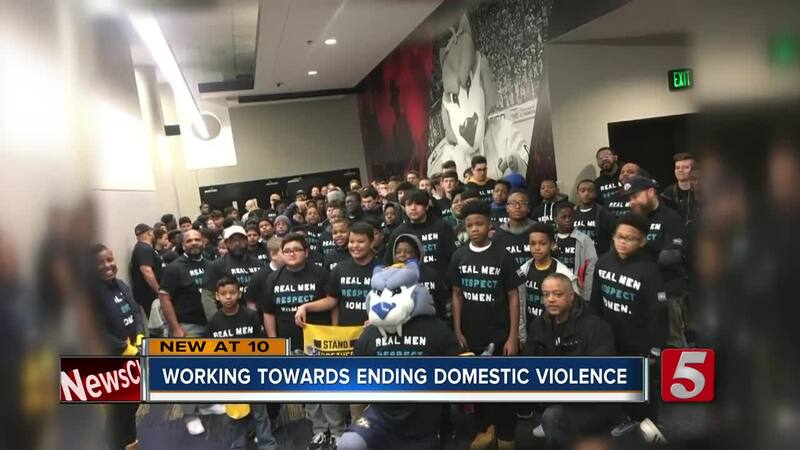 The organization partnered with the Nashville Predators to raise awareness on domestic violence and sexual assault. The Nashville Predators Foundations has committed to AMEND Together a five-year, $500,000 partnership in an effort to make Nashville the safest city for women and girls. The team is also giving the organization a second check on Sunday. "Whatever we raise today from the fans at the game, we are going to match it so I am estimating at least $150,000" said CEO Sean Henry. Predator's forward Austin Watson was the center of controversy last year surrounding domestic violence. He was suspended because of an incident involving his girlfriend. Preds CEO Sean Henry says when it comes to violence on women, the issue doesn't discriminate. Moving forward he hopes to keep bringing awareness to the issue and find ways to mend the crisis.